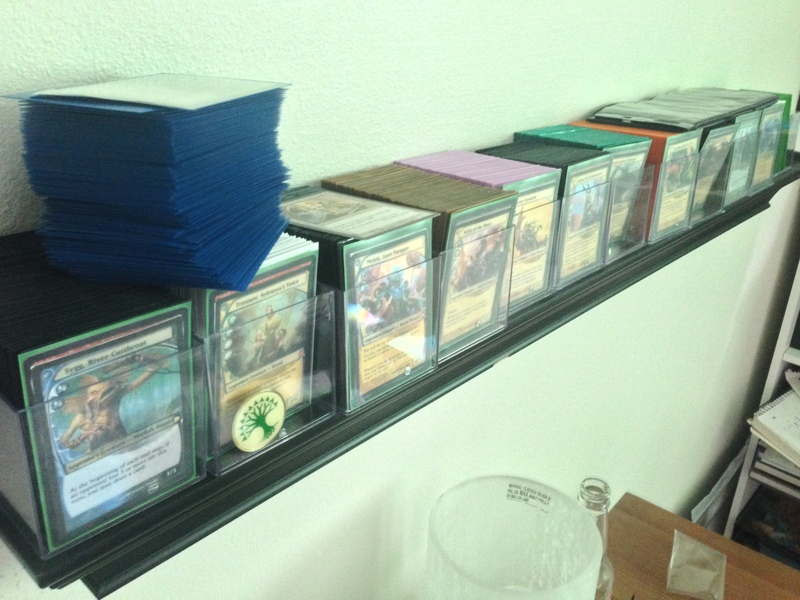 Last month, Mike Linnemann published an article on GatheringMagic where he showcased how players store their Magic collection. Mine was featured (thanks Mike), even though I just showed him my storage bookcase of my cards and not the entire room. I’ve wanted to do this post for a while, and because of certain events it’s either now or never. We’re going to peak behind the curtain and I want to show off just a little bit. We have a room in my house that my wife and I call “The Creative Room”. But this wasn’t the original purpose of the room: first it was an office for myself. My wife had her office on the first floor until our daughter was born. Then we had to reconfigure and merged our offices together into another room upstairs which is also going to be the playroom for the baby. This room was a remainder and we made use of the space. My wife is a very understanding woman; she knows that I have not only a passion for her (she is my number one passion after all), but for this very game as well. She gets I need some space and wants me to have an area that I could have my cards contained. I am a fortunate and lucky man. However, I know that her alternative motive is that if I keep my cards in a single room they don’t become spread out all over the house; she’s a smart woman. 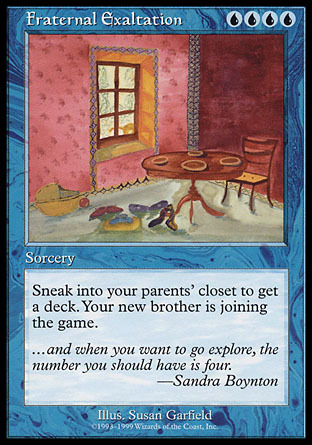 People who have larger collections and build decks all the time know how that works; it’s almost impossible to keep cards from migrating to different areas of the house if you don’t have a set area. My daughter has decided that since Magic cards fit so well into her hands she will take them all over the house in her travels. She is Johnny Appleseed of Magic in my household. Even though I’m a Melvin (who loves the interaction of the cards and the game), I do have an appreciation of the art in this game. Am I a closet Vorthos? I believe Mike Linnemann would say so. Why did I bring up the fact that I have an appreciation of the art of Magic? 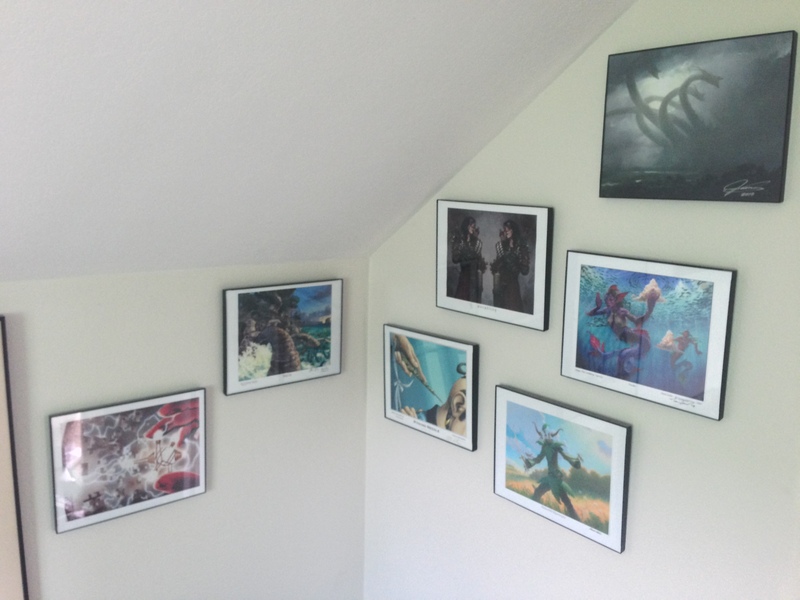 Because I have Magic art prints all over the walls. I apologize for the messiness of the room. Whenever an artist comes to a event in Seattle, I usually love to buy a print and get it signed (one of the main reasons I loved the large prereleases). One day I’ll buy an original art, but today is not that day. Most of the pieces that are hanging up are more “wife-friendly” pieces of art sans a Saviors of Kamigawa Pete Venters Pithing Needle and Torment‘s rk post Ichorid, which is down at the moment. Yes, not every print I own is up. 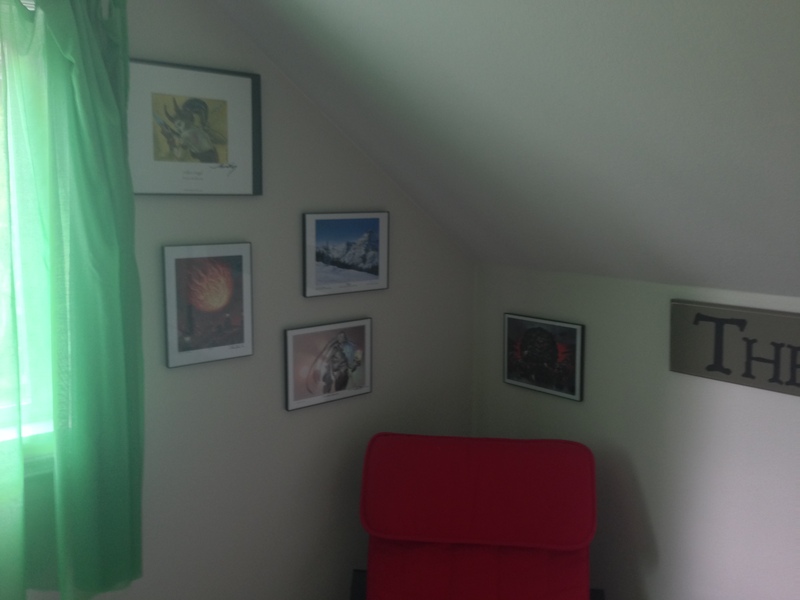 I’m not running a gallery where I change the art around, the room just happens to have an attic-like setup where the roof takes up wall space (The bookshelf holding all of my cards only fits because that’s the space behind the door, otherwise it’d been too tall to find a place in the room). Plenty of other prints are stacked up under the Modern Masters box waiting for a place to be hung. Included in that pile is Chris Rahn’s fantastic Black Lotus print he did for the MTGO Cube, one of my favorite cards in Stronghold‘s Wall of Blossoms by Heather Hudson (I must like plants killing people), and a few really oversize Magic cards including an Area set of basic lands. There’s just no more room on the walls without over populating it. I installed a hanging shelf on that hold my Commander decks. With 13 decks sitting up there currently, I’m just hoping that there’s not too much weight to topple it over. They’re sitting in Ultra-Pro deck boxes that kinda work (the top side fits much better for the double sleeved decks). I also mocked up the Commanders in the Future Sight style frames so that each one has a home. Of course, I have more decks that spots on the shelf so this is not a long term solution. The bookshelf houses most of my card collection (Well, what’s not on the table or in Commander decks). They’re sorted by color and converted mana cost inside Fat Pack boxes. The boxes are a great size to fit into this bookshelf and not too heavy to worry about moving from place to place. 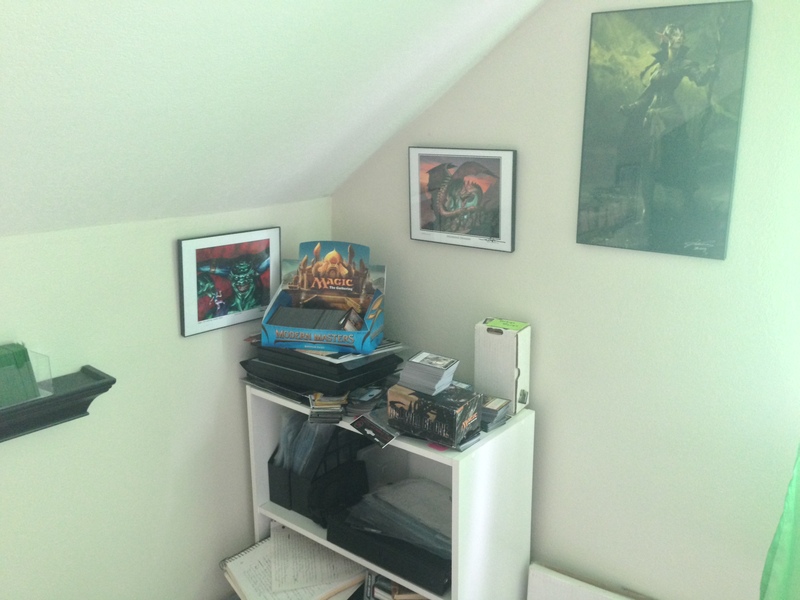 On the top of the bookself is a collection of MTG stuff. An empty box of each of the From the Vaults share space with some of the Magic novels (sadly unread at this point), and the collection of the new Magic comics. 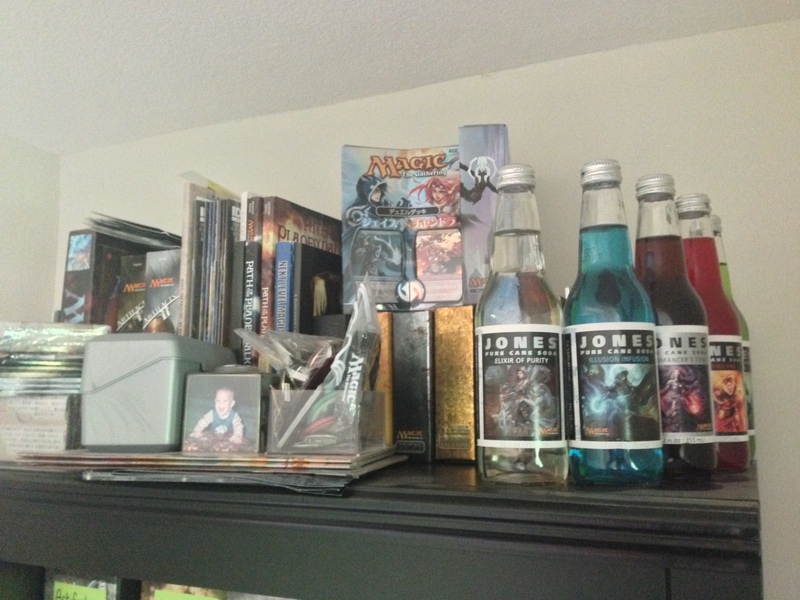 There’s my set of Magic Jones soda as well as various trinkets and other collectible objects: my GP Seattle Press Pass, unopened Mirrodin Besieged prerelease faction packs, a set of Magic poker chips, and other things. It’s just a random collection of things I think are cool or have sentimental value. These are some closeups of the concentrated areas of Magic prints. They’re in no real order but just whatever feels nice. I feel can appreciate the art of the game without being an expert on why it’s good. The art is one of the defining traits of Magic. For people who play it is instantly recognizable. Having the art on the wall makes the game seem bigger, and there’s more going on than just cards. It brings the game alive. In my office at work I’ve got the set of John Avon unhinged basics and they look totally in place in a work environment. Some people hang signed sports photos, I hang Magic art. Wizards had a one time offer of printing the art so it could be framed and displayed like I have setup. Obviously it didn’t work because I believe the main reason is that they wanted too much money ($250 for a print on a canvas is not the demo that would buy that). Now, it’s mostly handled by the artists because while there’s a market for this type of thing, it’s not a big one. I am thankful for the artists who do make their work available for purchase because it’s pretty cool to be working on deck and seeing the art of one of those cards hanging on the wall in my room. Even if they’re just print and not the real art, it’s still a great feeling. This post was part bragging, but part swan song as well. You see, all of this art is coming down. The Magic cards are being removed from the room. I knew that if I didn’t share this room now, I never would. I wish everyone who was passionate about Magic could have an area like this where they could let their geek flag fly. But for me, soon this will be no more. What in the world could cause me to take apart this room? Burying my lede, right? Since I announced my first child by Magic card, I figured it would be unfair if I didn’t do it for our second. Plus, this is a Magic blog, so I have to tie it in somehow. The Creative Room is going to become the new nursery. 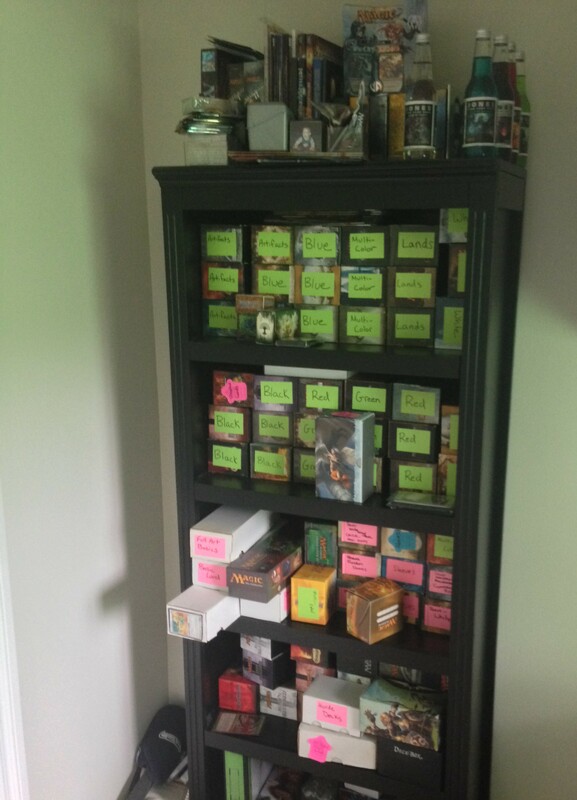 My Magic collection is moving somewhere, maybe in my Wife’s and my joint office while some of it will be stored away. We’ve got a little more time, the baby is due in March, but the room in its current configuration will be no more. I’m a little sad I won’t have this room anymore, but I’m very happy because of the reason. Magic is fun, but family is important. You’ll still get my erratic schedule here on MTG Color Pie, but I’m working on a few projects here and there so I’m not going away. We’ll return to the core of this blog, Magic design, next time because I have some beef with the new Commanders. You can always find me on Twitter (@MTGColorPie) where I do talk about Magic. Here’s looking forward about 7 years where we can start enjoying 4 player Vanguard Planechase Commander as a family. Those Commander decks are going to be filled with dust if you don’t cover them up.